Following the completion of the construction of new St. Peter's in the second decade of the seventeenth century, a series of monumental altarpieces was commissioned to decorate its altars. Here for the first time the altarpieces of St. Peter's are considered collectively, within the liturgical and artistic program of the building as a whole. 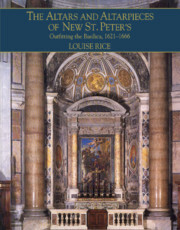 Louise Rice takes a comprehensive approach to this critical chapter in the history of Italian Baroque art, offering insight into the mechanisms, motives, and meanings of papal patronage in the premier church of Catholicism. Part I. The Early History of the Altars in St Peter's: 1. The congregation and the Chapter; 2. From Old to New St. Peter's; 3. Gregory XV and the St. Petronilla Altarpiece; Part II. The Altars under Urban VIII: 4. Towards a comprehensive project for the altars and altarpieces; 5. The dedications of the altars; 6. The project realised; 7. The Sopraporti; Part III. The Commissions: 8. Patronage during the Barberini Pontificate; 9. Artists at work; Epilogue; Catalogue; Documentary appendix; Appendices; Abbreviations; Archival and manuscript sources cited; Bibliography; List of illustrations.